It's time to cook a fish delight to liven up your taste buds. Accompanied by seasoned mint yogurt, the preparation simply rocks! Instead of grilling the fish, you can also make deep fried fritters by making some changes in the seasoning and batter. If snapper is not available, you can use almost any local fish variety. It's quite easy-to-make and can be refrigerated overnight before you grill it right before serving. Instead of mint yogurt, you can also serve it with a bowl of spicy dip or sauce. Grilled chicken can also be prepared in the same way provided you spice it up a little bit more. Let's quickly prepare our grill to make this lip-smacking and scrumptious grilled snapper recipe in a few easy steps. 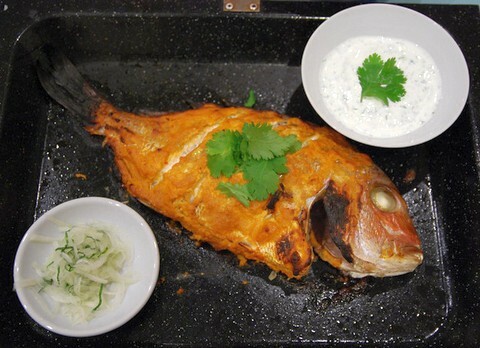 Try this delicious and aromatic grilled snapper recipe which is coated with a spicy and flavorful batter coating and is cooked to perfection for added taste. Clean the snapper belly and wash under running water. Make deep cuts on both sides of the fish with a sharp knife. Take a large bowl and add wheat flour, semolina and chickpea flour in it. Sift for a few seconds and add paprika, chili sauce, pureed red onion, ground pepper, fish sauce, yellow color, olive oil and salt in it. Slowly add water and whip all the ingredients to form a thick and smooth batter. Apply the batter on the fish inside out with your hands. Cover with aluminum foil and refrigerate for at least an hour. Meanwhile, add white pepper powder, minced mint leaves and salt in yogurt and give it a brisk whip for half a minute. Prepare grill on a high temperature. Grease the grilling basket with oil and carefully place both the batter coated snappers in it. Cover the grilling basket with a lid and grill the fish on a high temperature for about 7 to 8 minutes. Garnish with cilantro sprigs and serve hot with mint yogurt.